This is one of the healthiest things I’ve ever tried baking. It has greek yogurt, cornmeal, blueberries, wholewheat flour and..well, some sugar- for happiness, you know. ü To be honest, I didn’t like them, I had a hard time finishing one muffin; fortunately though, my family liked it especially my daughter whom I made these specifically for. She- my dear teenage daughter-lately had acquired a health/fitness bug, and became very choosy with food. She would only eat my baked goods if I use wholewheat flour; if it has no icing/frosting; with less sugar, as much as possible it should be made with honey or something not fattening. For her field trip, I decided to make these nutritious muffins; the recipe is adapted from Giada de Laurentiis, but instead of buttermilk, I replaced it with greek yogurt which I thinned with some milk to mimic buttermilk consistency and used wholewheat pastry flour. I halved the recipe, like I almost always do when I’m trying it for the first time. There’s a step in the recipe that uses food processor to incorporate the butter, as if you’re making dough. But I don’t have a food processor so I improvised by putting the butter in the freezer and grating it before adding to the flour-cornmeal mixture, a technique I’ve seen in some dough recipes. 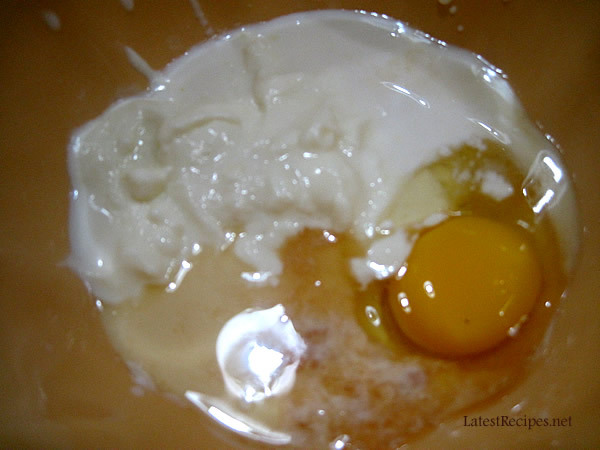 Next, combine the wet and dry ingredients together..do not overmix. 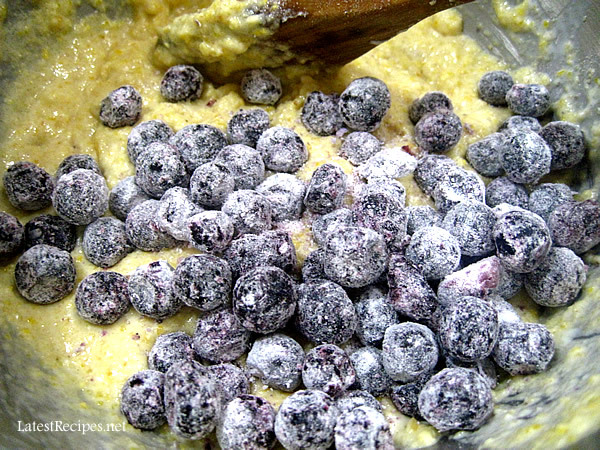 coat frozen blueberries ( you may also use fresh) with flour and stir into the batter gently. Position an oven rack in the center of the oven and preheat to 400 degrees F. Line a standard 12-cup muffin pan with paper liners. In a large bowl, whisk the buttermilk, eggs and vanilla to blend. Combine 1⅓ cups of the flour, the cornmeal, sugar, baking powder and salt in a processor, about 30 seconds. Drop in the cold butter cubes. 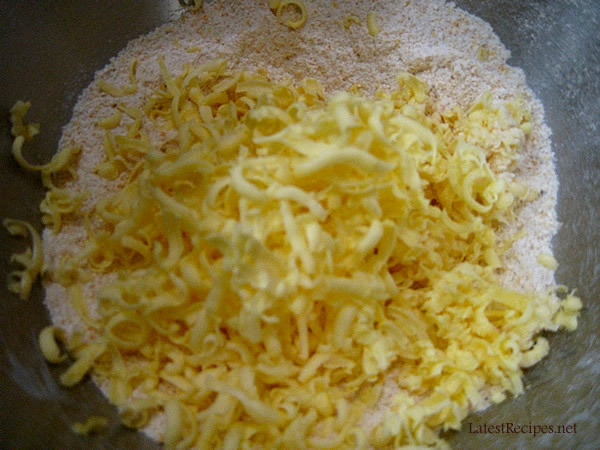 Using on/off turns, blend until the butter is cut in finely and the mixture resembles a coarse meal, stopping occasionally to check the size of the butter pieces, (they should be the size of rice kernels). 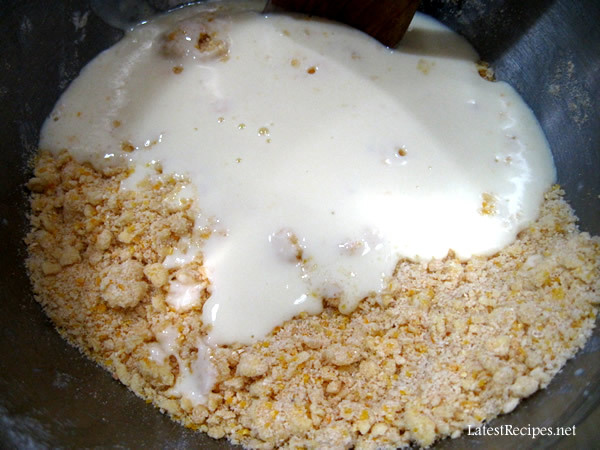 Pour the dry ingredients over the buttermilk mixture. Using a thin, flexible spatula and a few quick strokes, fold the batter together, turning the bowl as you fold. 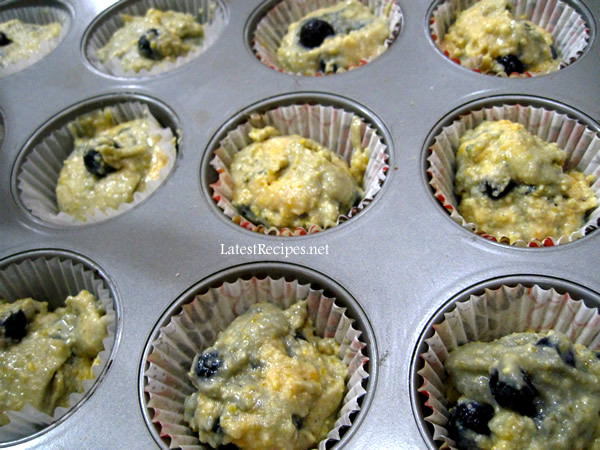 In a medium bowl, combine the remaining 1 tablespoon flour and the frozen blueberries. Toss to coat the berries. Scatter the berries over the batter and fold in. 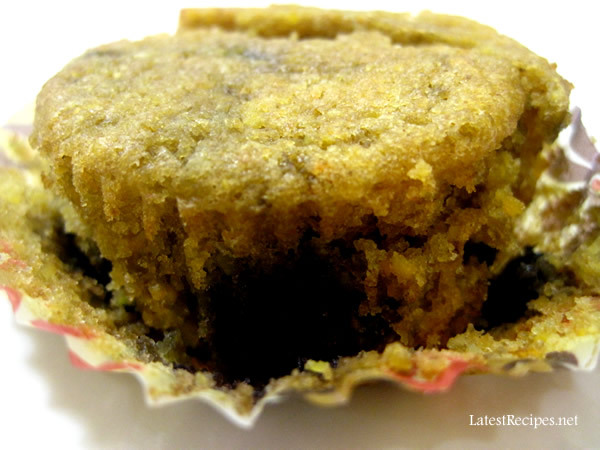 Using a rounded ⅓ cup of batter for each muffin, fill the paper liners, mounding the batter in the center. Use a knife tip or spoon to reposition at least 1 berry so it is showing on top. Bake the muffins until puffed and browning at edges, and a tester inserted into the center comes out clean, 20 to 25 minutes. Let the muffins stand 5 to 10 minutes. Twist each muffin in place to loosen the edges from the pan. Lift the muffins out onto a rack and cool. 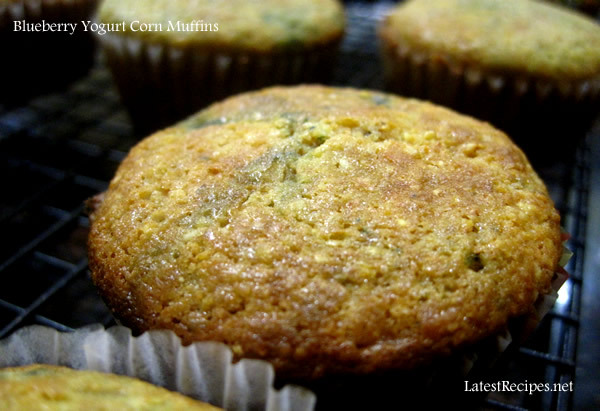 One Response to "Blueberry Yogurt Corn Muffins"
These look so sumptuous and moist!